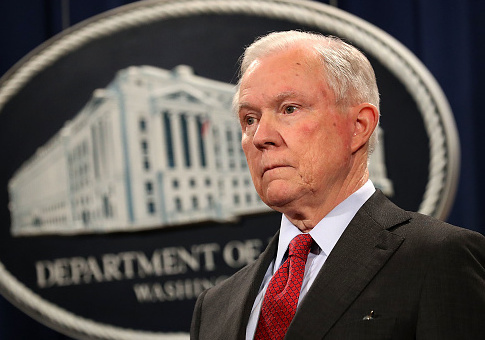 Law enforcement and prosecutor organizations gave their support to Attorney General Jeff Sessions's Thursday decision to rescind Obama-era guidance which discouraged prosecutors from enforcing the federal laws against marijuana in states which had legalized the drug. Sessions's guidance most prominently overturned a 2013 memo from then-Deputy Attorney General James M. Cole, often referred to as the "Cole memo." Issued in the wake of marijuana legalization in Colorado and Washington state, the memo instructed U.S. Attorneys to not enforce marijuana's schedule I status in states where its recreational consumption had been legalized and regulated. In its place, Sessions's new guidance simply instructs prosecutors to "follow the well-established principles that govern all federal prosecutions." Law enforcement officials applauded Sessions' move. "We applaud the Attorney General for this action today that brings clarity on enforcement of the law by rescinding a confusing policy brought on by the previous administration that hindered law enforcement. This will allow sheriffs to carry out their mission of upholding the rule of law and keeping their communities safe," said National Sheriffs' Association President Harold Eavenson and Executive Director Jonathan Thompson in a statement. Chuck Canterbury, president of the Fraternal Order of Police, saw the rescinding of the Cole memo not as an opportunity for the federal government to crack down on individual marijuana use, as some have feared, but as a return of discretion to law enforcement. "The Attorney General's announcement is good news for public safety and public health," Canterbury said. "There will be no Federal agents chasing individual users—but it will give law enforcement the discretion it lost when the Cole Memo was issued." Canterbury was one among a number of law enforcement officials who claimed that state-level marijuana legalization had had an adverse impact on public safety, pointing to increases in marijuana-related traffic fatalities. "This experiment of giving cover to drug dealers has had fatal consequences. When marijuana was ‘legalized' in Colorado, traffic-related deaths due to marijuana rose from 13% to 20%. This is costing people their lives," he said. "Drug-related deaths currently exceed motor vehicle deaths, and while some states have taken steps to change the legal status of marijuana, the substance's illegality remains federal law," noted Nathan Catura, president of the Federal Law Enforcement Officers Association. Bob Bushman, president of the National Narcotic Officers' Associations' Coalition, claimed in his own statement that enforcement was especially important given the nation's increasingly deadly opioid epidemic. "Given the current drug epidemic facing our country that is resulting in so much addiction and so many drug poisoning deaths," said Bushman, "we should be doing everything we can to discourage and curb illegal drug use. That includes marijuana." The President's Commission on Combating Drug Addiction and the Opioid Crisis concluded in its report that "there is a lack of sophisticated outcome data on dose, potency, and abuse potential for marijuana." Law enforcement also voiced support for Session's general commitment to enforcing laws as written, rather than encouraging rulemaking through overbroad prosecutorial discretion. The National Association of Assistant United States Attorneys made that case in its press release, calling for prosecutorial deference to the "rule of law." "NAAUSA's position is that the debate over whether or not to legalize marijuana should occur in the halls of Congress and not in the halls of the Department of Justice," the release read. "Accordingly, NAAUSA believes that the Attorney General's recent action with regard to marijuana enforcement is consistent with this strongly held principle that prosecutors should follow the Rule of Law as enacted by the Congress, until such time as the law is changed by the Congress." "Until Congress sees fit to make marijuana legal, the Attorney General and law enforcement have an obligation to enforce current law. Given these factors, this type of direction and support from the Attorney General is appreciated and will ensure national consistency on this matter," Catura, of the FLEOA, said. The A.G.'s order was condemned by pro-marijuana legalization organizations like the National Association for the Reform of Marijuana Laws (NORML). Sheriff Grady Judd, vice president of the Major County Sheriff's of America, specifically targeted such objections in his praise for the order. "The push across the nation by organizations like NORML to legalize marijuana under the guise of helping the sick has caused black market sales of so-called legal pot to proliferate in this nation, and it has given a greater and easier access of the drug to our country's most precious resource—our children," Grady said. "I commend President Trump and Attorney General Sessions for their leadership and action in repealing the Cole Memo." This entry was posted in Issues and tagged Drugs, Jeff Sessions, Marijuana. Bookmark the permalink.